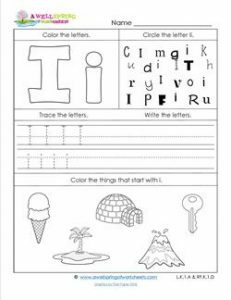 I need you to know how great these abc worksheets are… there’s lots of skills for kids to practice on this letter i page. Kids can color the big letters with crayons or markers or even paint if you want. They will look for the letter i, both upper and lowercase in the group of letters. Tracing a few letters and writing a few more will give that extra bit of more letter formation practice. And don’t forget about sounding out the objects and coloring the ones that start with the /i/ sound! Tons of fun, don’t you think?